Mayor Martin J. Walsh put his arm around Tito Jackson as they posed for a photo at the MLK breakfast held Friday at the Roxbury YMCA. 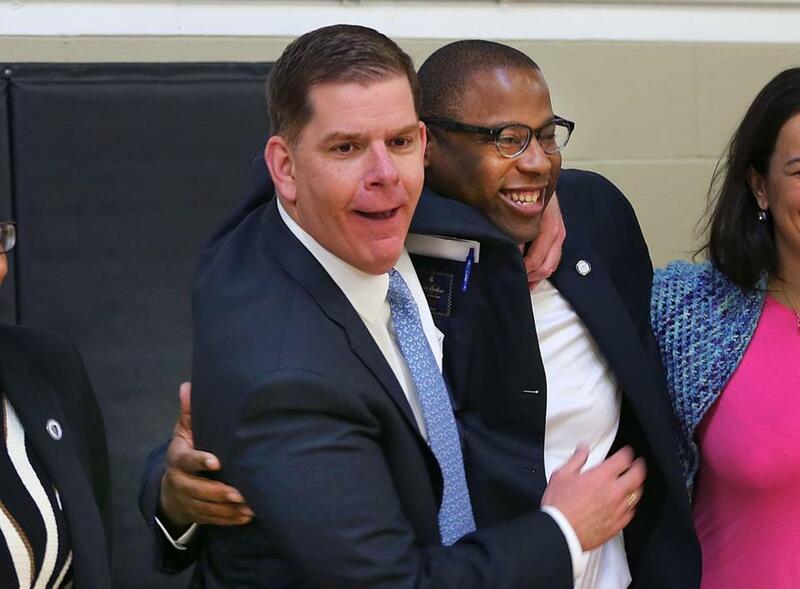 Boston Mayor Martin J. Walsh said his newly minted rival, City Councilor Tito Jackson, is a friend. Together, the men were all smiles and shared a warm embrace Friday morning as they stood side-by-side in the gymnasium of the Roxbury YMCA for a breakfast honoring Martin Luther King Jr. It was the first time Walsh and Jackson appeared together since Jackson formally launched his campaign for mayor Thursday. Walsh spoke at the event, which aimed to raise $20,000 for programs at the Roxbury YMCA, the organization said in a statement. Jackson didn’t have a speaking role, but mingled with the crowd, some who didn’t know the Roxbury city councilor had declared his candidacy for mayor. Following his remarks, Walsh told reporters that running against Jackson will make him a better man. He welcomes the chance to debate his record, he said. During his address to the breakfast, Walsh highlighted efforts he said were inspired by King’s legacy, including a building trades training program for people who have been involved in the criminal justice system, investments of more than $100 million in affordable housing, and citywide dialogues on race. He urged the crowd to continue to carry out King’s work after the holiday celebrating his life. Jackson told reporters that he stood by his decision to back Walsh in his 2013 mayoral race against John Connolly, who was then a city councilor. Four years later, Jackson said he is the best choice to help those who have missed out on the economic opportunities enjoyed by some in Boston. He cited the $276 million public incentive package for General Electric and the failed IndyCar race in South Boston as examples of Walsh initiatives that ignored the plight of those struggling to stay in the city. He said he plans to try to narrow the financial gulf between his campaign and Walsh’s by raising money at the grass-roots level. Jackson has just about $65,000 on hand for a mayoral bid, according to his most recent filing with the Office of Campaign and Political Finance. Walsh has about $3.5 million, according to the office. “We will work hard and we will ensure that all people, regardless of how big of a check that they can write, have a seat at the table when it comes to our candidacy,” Jackson said. One beneficiary of the new contest was the YMCA, the host of the first Walsh-Jackson face-off. The men each pledged a $1,000 donation to the organization. James O’S. Morton, president and chief executive of the YMCA of Greater Boston, said the organization wants to raise more than $150,000 this year for its Roxbury operation. “Our goal is to serve as many young people as we can possibly serve, providing them with the best, high quality services,” he said.